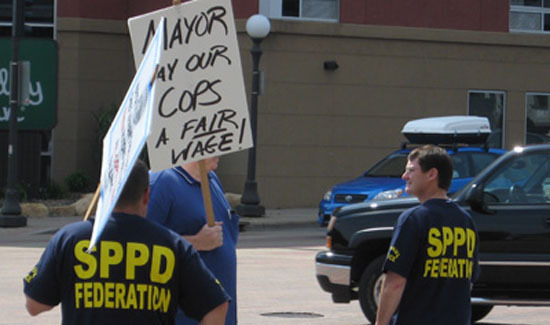 Several off-duty members of the St. Paul Police Federation picket in a dispute over a new contract. In Minnesota, a state arbitrator has awarded the St. Paul Police Federation, which represents more than 600 officers and civilian police personnel, a 6.25 percent pay increase over the life of a three-year contract. Despite the wage bump, which is retroactive to 2013 and was slightly better than what the City of St. Paul offered, union officials believe the department will remain among the lower-paid police departments in the Twin Cities area. The federation and the city had been at odds over pay since last year, which led to arbitration. The union said late last year that the department ranked 22nd out of 27 metro police departments in average annual salary based on 30-year career comparisons. That standing put it at a competitive disadvantage to hire and retain officers, the union said.